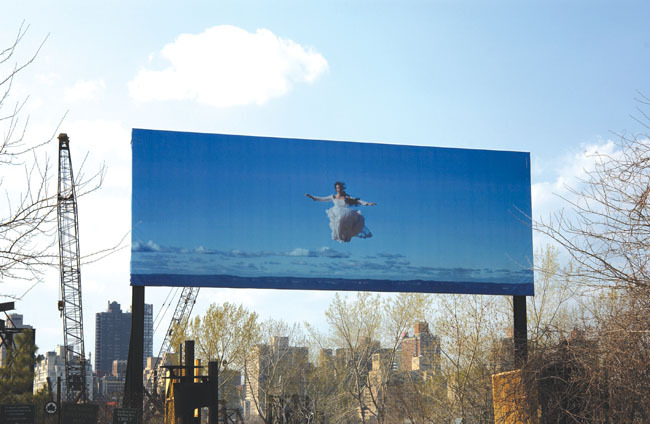 Flight Research #5 by Australian artist, Rosemary Laing, is an adaptation of a 1999 photograph translated into a 10’ x 28’ seamless vinyl billboard. The photograph features a bride poised in a moment of stillness, suspended mid-flight against the horizon line of the Blue Mountains, west of Sydney. Laing is one of Australia’s leading photo-media artists, and this is her first large-scale outdoor installation in the United States.